When opposites attract, sparks fly--like an electrical malfunction. That's what happens when former rodeo queen, Natalie Adams meets the new pastor in Diamond Falls. Upon the death of her father, Natalie returns to the Flint Hills to raise her two half-siblings and run the family ranch, giving up her dreams for the future. She soon realizes her time in college and as Miss Rodeo Kansas is not enough to break the bonds that held her as a girl. Jared Logan, a new pastor in Diamond Falls, is set on making a good impression to his first congregation, but finds that change doesn't come easy for some people. In fact, most in his congregation are set against it. Natalie and her troubled family provide an outlet for his energy and soon become his personal mission project. Having raised her stepbrother and sister from an early youth, Natalie's self-sufficient nature isn't inclined to accept help, especially from a city-boy do-gooder like Jared Logen. Though attracted to him, there's no way she'd ever consider being a pastor's wife. Bible studies and bake sales just aren't her thing. Jared repeatedly comes to Natalie's rescue, forcing her to see him with new eyes. At the same time, Jared's plan to plant Christ's word in Natalie's heart backfires when he loses his own heart to this wayward family. When problems arise in his congregation, he must face his greatest fears---of letting down God, his congregation, or those he loves. His time with Natalie has shown him the importance of standing by those you love, a lesson he chose to ignore in order to please his father years ago. This is put to the test when Natalie faces a battle of custody of her half-siblings against the mother who abandoned them twelve years ago. Natalie's fight for the children turns into a fight for custody of her heart as she learns the true meaning of unconditional love. In turn, Jared must decide which dreams are his own---and whether Natalie is part of those dreams. About "Seeds of Summer (#02 in Seasons Of The Tall Grass Series)"
Deborah Vogts and her husband have three daughters and make their home in Southeast Kansas where they raise and train American Quarter Horses. As a student at Emporia State University studying English and journalism, Deborah developed a love for the Flint Hills that has never faded. In writing this series, she hopes to share her passion for one of the last tallgrass prairie regions in the world, showing that Gods great beauty rests on the prairie and in the hearts of those who live there. 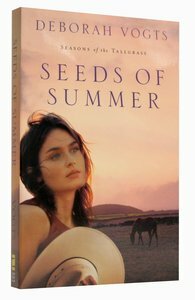 Customer Reviews For "Seeds of Summer (#02 in Seasons Of The Tall Grass Series)"
This second book in the series is an enjoyable read, transporting the reader to the ranch at Diamond Falls. Natalie returns home to care for her siblings, when tragedy strikes, leaving behind her dreams. She struggles to keep the ranch afloat. Meeting the new pastor for the area only complicates things further for her. I appreciated how faith was put into actions in this novel with the way the pastor responded to a woman in need. Too often faith and action don't go hand in hand. This was a great read with some excellent lessons in how to be a light in the world. Mattie Evans, a young veterinarian in rural Kansas, saves a horse injured in a terrible accident. But she also finds herself tending the wounded relationship between a prodigal son and his ailing father. Love, conflict, forgiveness, and renewal drive the first book of the Seasons of the Tallgrass series. Mattie Evans loves her work as a veterinarian almost as much as she loves the Flint Hills of Kansas. And she has a special place in her heart for a gruff old rancher, John McCray, who has become a father figure to her. So when John's estranged son, Gil, returns with thoughts to sell the family land and move his father to California, Mattie is drawn into a family conflict so deep that healing seems unlikely. As layers of secrets are peeled away and old guilt resurfaces, Mattie struggles to understand Gil's past and wonders how she fits into his future. Through the conflict, Mattie faces her own family's discord - complicated by a sister who has a few secrets of her own. This contemporary love story, the first of the Tallgrass series, broadens the scope of romance novels to draw a compelling picture of regional beauty, personal conflict, and ultimate forgiveness.